This Batman Bronze Statue by Iron Studios is $1,250...But Worth It? 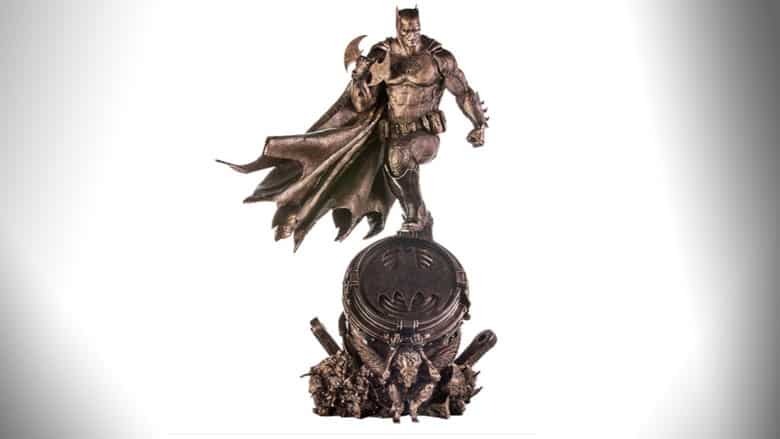 Collectible figure maker Iron Studios is bringing their bronze edition Batman statue to the market December 2019. The hand-painted, pure bronze statue is based on concept art by Brazilian DC Comics artist Ivan Reis. The statue depicts an authoritative Batman standing confidently atop a Bat-Signal, with his left hand tightly clenched and his right hand firmly wrapped around a Batarang. Oh look, it’s Joker Gargoyle trying to pry himself up from a pile of rubble from underneath the Bat-Signal; a close eye will take notice to the sheer amount of intricate detail that went into this section of the statue—from the twisted rebar snaking its way through the shattered concrete to the meticulous etching on Joker Gargoyle’s wings. Batman fan or not, it’s a fascinating figure to behold, and certainly one that qualifies as a conversation piece. The statue measures approximately 35 inches tall, 23 inches wide, and 19 inches long. And at nearly 50 pounds (or the mass of an average seven-year-old), one could say this collectible statue is well worth its weight in gold. But this badass bronze Batman statue comes at the hefty price of just $1,250. The good news is that shipping is free on orders over $100. Pre-orders are already open on WB Shop, and orders are expected to ship on December 13, 2019. This item ships to both the USA and Canada. If this one’s too rich for your Batman blood, you could always opt for Funko’s 80th anniversary 1st appearance 1939 Batman Pop! Vinyl figure. That one is $11 and it comes out this March. Either way you look at it, anything Batman is always fun and exciting. Personally, I think I’ll stick to Funko’s Pop! figure. Because price. And portability. Though I would love to be able to fund something like this one day, I’d much rather spend my money on a statue of Batman and his Batmobile. Check out more ridiculously cool Batman gifts to blow your rent money on here.